You can connect multiple data sources into Baremetrics. Keep in mind though that these data sources will be combined–you won't be able to break out the metrics by individual data source. If you haven't yet, connect your first data source. Allow the import and calculations to finish and your dashboard to be displayed. Once you have your first data source in place, head to the Data Connections page in Settings. Once there, click on "Add Connection" for the data source you wish to add. Refer to the platform-specific steps to connect for additional details. 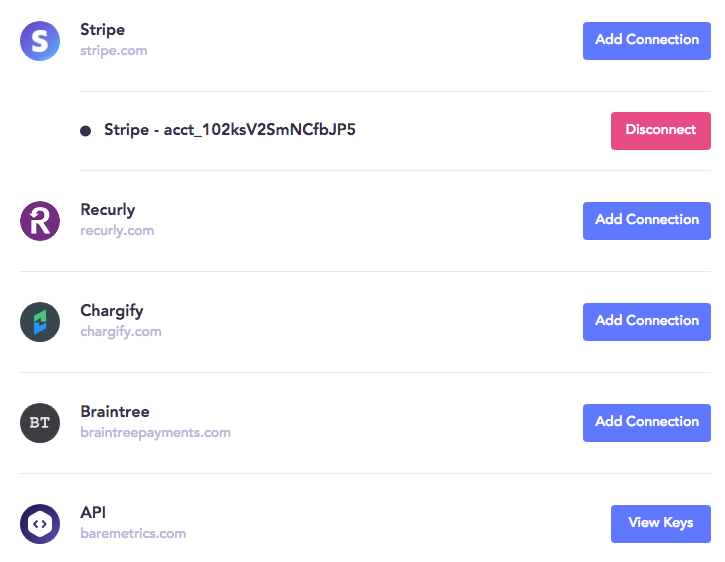 Stripe, Braintree, Recurly, API.